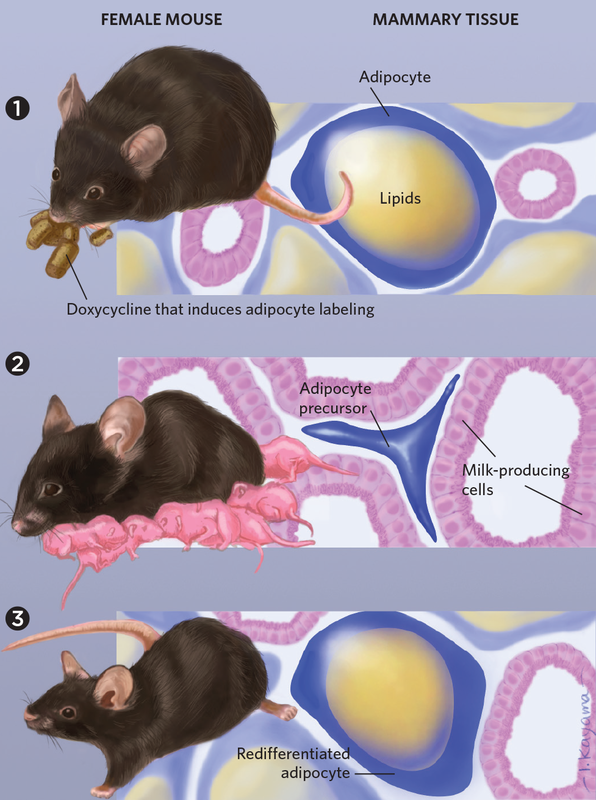 Adipocytes lose their lipids and reprogram themselves into stem cells during lactation, then turn back into fat cells after pups wean. Q.A. Wang et al., “Reversible de-differentiation of mature white adipocytes into preadipocyte-like precursors during lactation,” Cell, 28:P282–88.E3, 2018. Breast tissue undergoes a remarkable transformation to allow for breastfeeding—and the process reverses after weaning. Lipid-filled fat cells essentially disappear to make room for milk production, and once an animal is done lactating, the cells come back again. 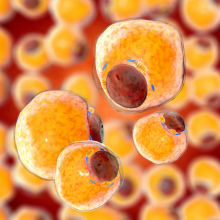 While the phenomenon of the disappearing-reappearing fat cell is well documented, the fate of these cells, called adipocytes, during the cycle was a subject of debate. Do the cells die off, or turn into another cell type? And in either scenario, how do they make a comeback after lactation ceases? 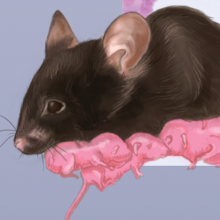 To find out, Philipp Scherer’s group at the University of Texas Southwestern Medical Center took advantage of the lab’s AdipoChaser mouse, in which mature fat cells that are stained blue retain their color permanently. The investigators found that during pregnancy and lactation, these big, blue fat cells shed their lipids, change shape, and become much, much smaller. “Morphologically, it’s a very dramatic alteration,” says coauthor Annabel Wang, a former postdoc of Scherer who now runs her own lab at City of Hope, a hospital and research center in California. The adipocytes also change their gene expression and identity: Wang’s analysis of single-cell RNA sequencing indicates they de-differentiate into fat-cell precursors. Then, when the mammary tissue reverts to its pre-pregnancy configuration as the pups wean, these precursors give rise to differentiated adipocytes. ADIPOCYTE RECYCLING MODEL: Before pregnancy (1), mouse mammary tissue contains large fat cells filled with lipids. 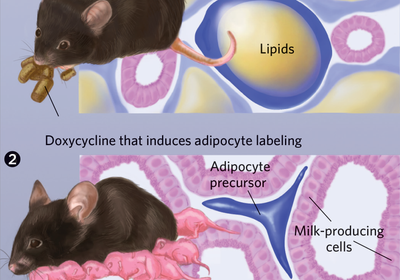 To follow the adipocytes’ fate through lactation, researchers stained them blue. 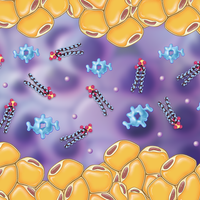 During breastfeeding (2) , these labeled cells lose their lipids and shrink dramatically. They also show signs of reprogramming to a precursor state. After lactation (3), when milk-producing cells die off in a process called involution, these same blue cells fill back up with lipids and redifferentiate into adipocytes. “All the fat cells in the regenerated fat are labeled in the original color,” says Scherer, indicating that they don’t die off, nor do they transdifferentiate from milk-producing cell types, as other scientists had proposed. The researchers watched this shrinkage and expansion of the blue-colored cells over several cycles of pregnancy and lactation. Shortly after Wang published her results this summer, Valerie Horsley’s team at Yale University reported complementary observations. In mice, the researchers found, fat cells shrink by losing lipids to make room for milk-producing tissue, then regain their composition when that epithelial tissue recedes (Nat Commun, 9:3592, 2018). 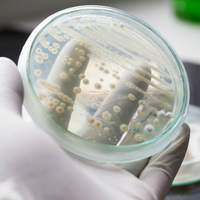 Horsley and her colleagues also discovered that the fat cells, as they’re bulking up again, pull lipids from those regressing milk-producing cells. “It’s kind of recycling the milk, which is really cool,” Horsley says. “Both papers seem to have settled the long-standing question of whether adipocytes disappear during pregnancy and lactation or remain present during these phases as smaller, compressed cells,” says Jane Visvader, the joint head of the Breast Cancer Laboratory at the Walter and Eliza Hall Institute of Medical Research in Australia, in an email to The Scientist.